In the fourth book to feature forensic archaeologist Ruth Galloway the mystery starts early on. Ruth has been asked to attend a local museum for the opening of a coffin which was found at a construction site and is thought to contain the remains of a medieval Bishop. She arrives to find the museum’s curator lying on the floor. Not being certain if the man is alive or not she phones an ambulance and the police. The man is pronounced dead on his arrival at hospital and the police investigation steps up a notch which introduces DI Harry Nelson to the action. Of course anyone who has read the previous novels in this serious would have been waiting for this meeting as Ruth and Harry have a personal history which was left at a rather dramatic point at the end of The House at Sea’s End. I’m trying not to give spoilers to this or previous books so I won’t say much more, other than to reflect that I thought Griffiths did a good job of capturing the awkwardness realistically. She’s also done a good job of encapsulating the essence of the personal lives of Ruth, Harry and their friends and colleagues so this would be a decent place to start the series if you are interested in trying it out but don’t feel you have the time or energy to read the three earlier books. The mystery element in this novel is stronger than has been the case in the previous novels which, while entertaining, were all fairly easy to stay ahead of, especially for seasoned crime readers. Here there are several threads that need to be sorted out including the very basic question of whether or not the museum curator was murdered or not. There do prove to be two potential motives including a possible connection to claims being made for the repatriation of Australian Aboriginal bones and skulls in the museum’s custody. Ruth’s old friend Cathbad is a member of a group which has requested the items be returned to Australia for a proper burial, as is her new next door neighbour who is an academic visiting from Australia. He is also a member of the same tribal group to which the bones belong so he has a personal stake in the repatriation of the items. The issue of such repatriation is becoming increasingly vitriolic in the real world but Griffiths handled its complexity and sensitivity well. In particular Ruth’s needing time to weigh up the pros and cons on a personal and professional level rang very true. I’m always a little wary of ‘foreign’ books which throw in Australian characters or tackle other subjects I am familiar with but Elly Griffiths has done well on both counts here. It’s fair to say that most fans of this series are at least as interested in the personal stories of Ruth, Harry and friends as they are in the whodunnit aspects of the books and those fans will not be disappointed with this instalment. Ruth’s daughter has her first birthday in this book but Ruth still frets about her mothering skills and seems a little preoccupied at times so she is not quite the dominant character in this book as she has been in the past and Harry’s dry humour is also quiet for a while when he undergoes a particularly nasty trauma. While I did miss the presence of my favourite two people a little, there were many developments in the lives of the lesser characters to keep me interested. I have quite a soft spot for Cathbad who is a lab technician at Ruth’s university but is also a Druid and seems willing to participate in any vaguely spiritual ritual he thinks suitable for a given situation which often has unforseen circumstances. I look forward with much anticipation to the arrival on my doorstep of the annual instalment of this series and, once again, the reading experience lived up to my expectations, providing a very enjoyable and satisfying read with just a hint of what might happen in the next book.. 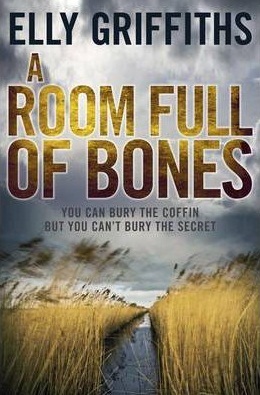 I read A ROOM FULL OF BONES in a single day (again the housework was neglected) and had a very contented smile on my face upon completion, you can’t ask for better than that. Great to see that you had a smile of contentment on your face upon finishing this book. Ruth Galloway is one of my favorite characters and I also can’t wait to see what is happening with her. Right now, I’m still waiting for book three which my library system just received, so it should be soon. It’s such a pleasure to curl up with an old friend and read a good story. PS Glad to read what you write about the handling of the Australian Aboriginal bones aspects. It rang true to me too, based on our coverage of it in Nature News (as you say, vitriolic stuff going on), but good to get an endorsement from the true source! I’ve seen Elly Griffiths books in the bookshops but never tried any of them. I picked one up over Christmas but the blurb din’t grab me and I put it back down. If this is one of her stongest books, I might give it a try. I don’t really want to start at the beginning of the series as it then seems to take me an age to then read the most current book. A high recommendation from you, Bernadette. Bernadette – What a great review – thanks. I really like this series, too, and it’s so good to hear that it’s staying up to its standard of high quality. Just waiting my turn at our library…. No, I won´t read this review yet. I just saw a glowing review of the third today (which I haven´t bought yet), but the ebooks still cost around $ 10 so I can wait. I can wait, I can wait…. I just finished House at Sea’s End… I will not buy this book. I will not buy this book. I. Will. Not. Buy. This. Book. Hope you are staying strong Cathy. I find the most frustrating thing about this series is that it is possible to get “House at Seas End” on Kindle, but the previous two are only available as “Audible Books”. I suppose it is a reflection of how spoilt we have become that we can download in a couple of clicks the books we see reviewed around the world, or buy them from Book Depository and have them arrived in a matter of days (as opposed to waiting months from the library). Once I would have been delighted to scurry down to the bookshop and part with three times what it costs on Kindle. But you know, I really want this book! I actually thought Elly Griffiths might have changed publishers due to the strangeness of format/geographical availability – but no it’s just wierdness. I just finished The House at Sea’s End, the third book in this wonderful series. I, too, neglected all errands and tasks at home to read this book over the weekend, and sat here contentedly with a smile on my face. More than the mystery involved, I liked Ruth’s thinking about her personal dilemmas and dealing with her self-doubts. She endeared herself to me even more than in the first two books. A “post-good-book slump” started after I turned the last page, but I think it’ll stop as soon as I tackle the TBR pile here.